One of Britain’s newest warships – the HMS “Duncan” – was recently in the Black Sea to showcase the capabilities of a modern Type 45 air defence destroyer. Romanian visitors to the ship included the Chief of Defence, the Heads of the Navy and Coastguard, and other VIPs. ICE UK earlier participated in the design of the Type 45 destroyers as a subcontractor to the UK builders, now part of the defence contractor BAE Systems. 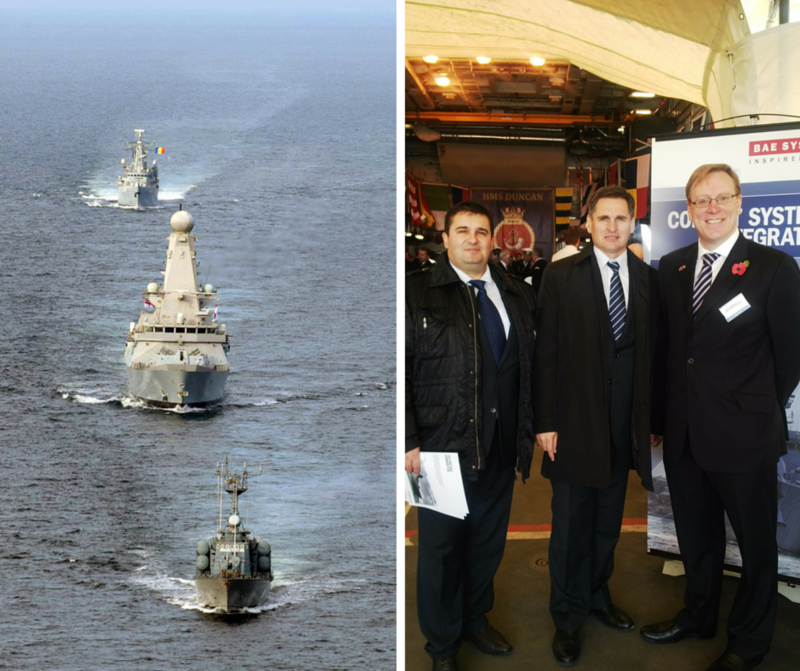 ICE was therefore honoured to be invited to participate in events on board HMS “Duncan”. On the left: HMS “Duncan” shown between the “Regina Maria” (formerly HMS “London”) and the missile boat “Zborul” during joint exercises in the Black Sea off Constanta (photo courtesy: Cristian Vlasceanu, Romanian Navy). On the right: ICE’s representatives are pictured here with Mark Taylor, BAE Systems Business Development Manager.